April 12, 2019, 8:19 PM · With all the Baroque music that we teach beginning violinists, doesn't it make sense to teach them something about Baroque performance practice? Violinist Rachel Barton Pine thought so, when her daughter, Sylvia, started taking violin lessons and going through the Suzuki books several years ago. The Suzuki books contain quite a lot of Baroque pieces -- the Bach Minuets, Lully Gavotte, Vivaldi concerti, the Bach Double...the list goes on. This presents so many opportunities to introduce students to early music practices -- but how to go about doing so? Once Pine, along with Sylvia's teacher, Isabelle Rozendaal, starting looking into it, they discovered that there are early music education programs and ensembles springing up all across the United States, and they seem to be a big hit with young musicians. Last month, Pine shared her own experiences with Sylvia, and she also brought together a group of teachers and students from Baroque programs around the country to talk about their programs and to perform at a workshop called "Baroque for Beginners and Beyond" at the American String Teachers Association conference in Albuquerque, N.M.
Pine herself has studied the subject of period performance deeply, having played in the Baroque group Trio Settecento since 1997 and having pursued a lifelong interest in rare Baroque instruments such as the rebec and the viola d'amore. She also drew on Baroque historical practices in her 2016 recording of the Bach Sonatas and Partitas. When her daughter Sylvia's studies brought her to pieces such as Bach's Musette in Book 2, Pine and Sylvia's violin teacher decided to introduce some elements of early-music style. They looked at pieces in their original forms -- here, by the way, is a wonderful resource Pine recommended that explains Suzuki Violin Pieces in their Original Forms. "Some of those versions were wildly different, with different notes!" Pine said. Pine also drew on the work of her colleague from Trio Settesento, Baroque cellist John Mark Rozendaal, who devised new ways to teach the viola da gamba to young students. John Mark Rozendaal's da gamba class. He came up with a curriculum and pedagogy for his Viola da Gamba Dojo that combines ideas from various disciplines: a dojo's multi-level group learning; a Suzuki group's common curriculum; a ballet class's ritual of practicing basics; and a church choir's combination of pros, amateurs and kids. Pine said that since she has done so much research on the subject, she plans to create a series of early music books for students, with recordings made at A=440, a capella vocal versions and videos with practicing and teaching tips. 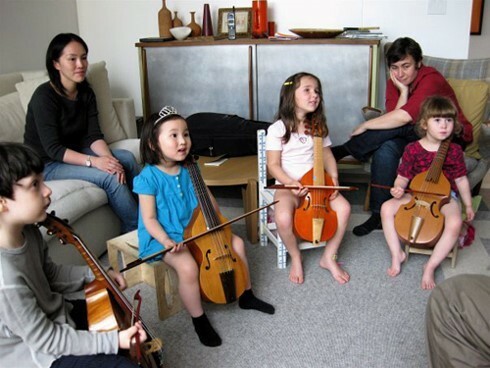 Another teacher who has come up with an early music program for young students is Shulamit Kleinerman, who talked about her work with Seattle Historical Arts for Kids, as well as her private violin studio. She specializes in Renaissance music and art, and she plays her violin off-shoulder style when doing Renaissance music. Kleinerman said that what loves about Renaissance music is the fact that each instrument has its own part, and that every note you make is heard. Her Early Music Youth Academy evolved from hands-on art classes, to which she added some singing of Renaissance music. That evolved into doing plays, which involved dancing and fencing, and this led to the instrument-playing. Among her traditional private violin students, "I kept noticing that there was a persistent minority of students for whom this was not going over," she said. What was not going over? The powerful, loud nature of modern violin playing. "It's just so high and loud!" one student complained. Another actually wore earplugs. When she handed one of these students a viola da gamba -- she loved it. At ASTA Kleinerman shared some videos of kids from the Early Music Youth Academy playing viols and harps, singing, and talking about the music. They described early music as delicate, sparkly and less intense. They enjoyed that it was more mathematical and intricate, and one said that it was a "challenge to read, a challenge that's worth it." When kids start getting involved, making stylistic decisions about music, it helps them not only in playing Renaissance or Baroque music, but they also start thinking more stylistically about Romantic music, modern music -- any kind of music, she said. "Learning any style, as a style, supports learning other styles," Kleinerman said. Another success story came from Davis High School Baroque Ensemble, of Davis, California, which prides itself on being the first public school Baroque ensemble. Run by Angelo Moreno, it is an audition-only group. The money for converting all the instruments, purchasing Baroque bows, adding gut strings and purchasing new music money came from the parents and community donations. It grew from an already-successful orchestra program that was looking to expand, and its popularity among the students helped in its success. "I think that to start a Baroque Ensemble, especially in the eyes of your district, you must show with concrete numbers that your enrollment trends warrant this sort of expansion and that proper performance of this type of music warrants this type of ensemble," Moreno advised. He recommended creating it as a higher-level program, as a goal for students to work for. The Davis High School Baroque Ensemble has played at the Berkeley Baroque Festival, gone on several international tours and been featured in several national publications -- all things that help its success to breed more success. At this point a junior high Baroque ensemble is also developing in Davis, to feed into the high school orchestra. A Baroque program in Ann Arbor, Michigan, grew from existing music programs at the Community Music School of Ann Arbor, which includes about 40 percent scholarship students. One year, "we started a journey of discovery," said cello instructor Kasia Bielak-Hoops. They wanted to explore what it was like to play Bach's Brandenburg Concerto No. 5, in its original form. After doing so, they decided they had enjoyed the process so much that they would learn one Brandenburg concerto every year, and they called it the Brandenburg Project. At this point, it has been six years, and along the way their ensemble has evolved to be more and more "Baroque." For example, last year the program received Baroque bows from Shar, and "that really opened up their world," Bielak-Hoops said. They also obtained a Baroque oboe and dropped their pitch to A=415. In a video that Bielak-Hoops showed at the ASTA workshop, kids gave the program high praise. Students said they enjoyed the opportunity to lead the ensemble in a more concrete way and to make decisions together about the music. "We are youth-led," said one student, "we have a lot more say, in what you do with the music." Another said that "this feels more like a community than any other ensemble I've been in." Bringing in experts from the nearby University of Michigan has also made a big difference for the Brandenburg Project, Bielak-Hoops said, and she recommended that other growing programs try doing the same. Guest artists not only provide inspiration and new ideas, but they also form a connection with the ensemble that can lead to more opportunities. The teachers felt like they were learning nearly as much as their students, she said. For the program at Stevenson High School, they started small and kept building and adding instruments such as lutes, viols and that big theorbo. "We share ideas, and there is a lot of back and forth with the students," said Director Enrique Vilaseco, who sometimes plays along with the group, directing as concertmaster. "There's a lot of community in what we do." April 13, 2019 at 02:06 PM · No matter what string instrumentation you have, Vivaldi wrote something for it. Baroque music is great for kids! That's why the first couple of Suzuki books are loaded with it. Best wishes to you no matter what!!!!! *Agree Vivaldi is lovely for babes to Centenarian's!!!!! April 13, 2019 at 06:09 PM · Hi Elisabeth, I'm afraid you are very far out of date in your thinking. Most of the young artists of today were trained at some point in the Suzuki method and they are beautifully expressive. I must disagree strongly with your dismissive and ill-informed assumption about the Suzuki method. April 13, 2019 at 06:45 PM · Hi Laurie, Baroque music for youngsters! What a great idea! where can I find a list of such groups/schools? Is there one near Pasadena, CA? Thanks! April 13, 2019 at 07:02 PM · This is really cool! April 13, 2019 at 07:13 PM · At this point there are really only a few such groups, and none that I know in Pasadena CA (though if anyone knows of one, please do share!). I do believe that Rachel was presenting this at a giant conference of the American String Teachers Association in order to inspire people to start up such groups in their own communities, and to provide them some guidance and expertise in doing so! April 14, 2019 at 12:33 AM · The Baroque era has the single largest body of original, (not simplified editions) material for the string orchestra that is at the student technical level. Vivaldi's orchestra in Venice was a "student" orchestra- the well-financed girl's orphanage. To get around the Viola problem; the viola parts for all of the Corelli Concerto Grossi never use the C string! Bach wrote more difficult parts for second violin and viola, but there is also lot available from Telemann, Rameau, Lully, etc. April 14, 2019 at 10:16 PM · In addition to the good points Joel makes, Baroque music is fairly simple from the point of view of harmony and counterpoint and is an excellent kind of music from which younger folks can learn the building blocks of music theory. At present the DHS Orchestra Program has grown four times its’ original size in the past 16 years. By 2008 the program had developed into 2 groups the “DHS Chamber Orchestra” a non-auditioned string orchestra including violin, viola, cello, Bass, at 55 students, and the “DHS Symphony Orchestra” an auditioned full symphonic orchestra including woodwind, brass, percussion, and stringed instruments, at 75 students-making a total of 130 students between two groups. The growth at the High School is contributed to the growth at the elementary school and junior high level music programs and the positive continuation rate of orchestra students from 7th grade to 12th grade. As the two orchestras continued to grow there came the need for a third orchestral ensemble. Like a Jazz band for a band program or a Madrigal Choir for a choral program the DHS Baroque Ensemble became a natural extension of the DHS Orchestra Program as well as the second audition orchestra at DHS. This group provides students the opportunity to focus on Baroque music, Baroque performance practices, and master technique skills on period style instruments in a smaller ensemble. The period style instruments allow the unique style of the era to be further developed making the overall performance experience more historically accurate and engaging for the student musicians. The DHSBE also allows orchestral students the ability to access a rich and diverse wealth of orchestral literature unique to the development of music as we know it today, which was not possible within the organization of the orchestra program prior to the creation of the group. The DHS Baroque Ensemble was featured in several national publications including “Symphony Magazine-Online”, “Early Music Magazine”, “Strings Magazine”, “Teaching Music Magazine”, and the “California Music Educators Association-Online”, for its unique nature and the model it represents for what is possible in the development of other public music programs since the DHS Baroque Ensemble is the first group of its kind at the High School level in the USA. Without the support of the school administration, district administrators, and the school board this new course would not have been possible. The district supported the course by passing the course proposal unanimously and allowing the DHS Music Department to implement the DHS Baroque Ensemble into the DHS Orchestra Program. Unfortunately, there were no grants or monetary support from the district beyond teacher FTE. It costs about $12,000 to convert all the instruments and purchase the Baroque Bows for 20 violins, 6 violas, 6 cellos, and two basses. Doing half conversions saved us from having to purchase all new instruments. I used the best instruments in the school district collection that had been donated over many years. The half conversion included: removing the chin rests, adding baroque tailpieces, baroque bridges, adding gut strings to all the instruments, and purchasing new music specifically for this ensemble. I also added Precision Tuners to all the instruments because gut strings have to been tuned frequently. I found that the students had a hard time getting perfectly in tune with the regular peg tuners. The precision tuners have made a world of difference. The money came from the parents and the many community donations made to our Orchestra Boosters over the years. Our Booster group financially allowed this new group to start off well equipped with period style instruments including a professional level John Phillips (1991) Harpsichord and style appropriate music. We have since acquired a wonderful Baroque Chamber Organ, which adds to the diversity of our continuo sound. The orchestra students earned the creation of this course and sealed the commitment of the School District with their continuously climbing enrollment numbers, commitment to the program, and love for playing orchestral music. It should be noted that the DHSBE has received vital support from the UCD Music department and was inspired by UCD Baroque Ensemble directors Phebe Craig and Michael Sand musical mentors of Angelo Moreno. Routinely Phebe Craig generously shares her harpsichord expertise by coming to DHS to coach the harpsichord students individually and within the group rehearsal. The group is also privileged to have Richard Webb, former member of the Academy of Ancient Music, as a continuo coach for lower strings. Richard is also a wonderful artistic consultant and resource as well as group dynamics coach. The group has collaborated with the UCD Baroque Ensemble directed by Michael Sand and Phebe Craig, the CSUS Camerata Capistrano Directed by Lorna Peters, UC Berkeley Baroque Ensemble Director Davitt Moroney, Philharmonia Baroque Orchestra members Carla Moore, Mia Silverstein, Robert Howard, Elizabeth Blumenstock and American Bach Soloists member Katherine Heater. Most notably in 2014 and 2017 the DHSBE was honored to have Rachel Barton Pine as our guest soloist. We look forward to a possible return visit by Rachel in June 2020. The DHS Baroque Ensemble made its debut on the main stage at the 2014 Berkeley Baroque Festival and is proud and honored to have been invited back to the main stage in 2017 and again for the 2020 Festival. In June of 2017 the DHSBE accomplished its second major international tour, the first one being in 2014 to Italy for 10 days. The 2017 tour wa 14 days starting in Vienna and ending in Italy. The group performed in historically significant Baroque Cathedrals major cities including: Vienna, Eisenstadt, Salzburg, Wattens, Innsbruck, Venice, Padua, Cremona, Lucca, Montecatini, Florence, and Rome. The group plans to return to Europe in June 2020 for a tour to England and France. Angelo Moreno had been in the process of locating a Harpsichord for 1.5 years even prior to the group’s initial existence. The instrument was found in San Jose, California USA at the St Joseph’s Cathedral just by chance. Mr. Moreno was in the church performing with my daughters Giavanna (violin) and Dchenin Moreno (cello) in a trio at a family wedding and he just so happened to spot three harpsichords covered up in the back of the room. After investigating with the Church Director, he found out that these instruments were donated and that the church wanted to sell them to raise funds for a concert series. Since the church director knew Mr. Moreno was a director of a public school orchestra program and that the instrument was going to be used to educate young musicians, she was very generous with her final offer. Mr. Moreno had Larry Snyder and Phebe Craig, both harpsichord experts in Davis, California and friends of the DHS Orchestra Program assist him every step of the way. They advised him on all the instrument details as well as confirmed for him that he had found the best instrument and price possible on the open market. An alumni donor from the DHS Orchestra Program helped to offset the price of the instrument considerably. This donor contacted Mr. Moreno out of the blue one day 4 months prior to the group’s existence and shared with him that she was interested in donating a harpsichord to the DHS Orchestra Program in memory of her mother who just passed away. Her mother was a former music teacher and lover of harpsichord music and listened to harpsichord in her final days to comfort her. He shared with her the coincidence and perfect timing of her contacting him and that he was the only high school director in the country that would need a harpsichord since the DHS Baroque Ensemble was to be the fist one of its kind at the high school level in the country. The Instrument we obtained was built by John Phillips in 1991 in Berkeley. The instrument is called #44 which indicates the order in which he builds them. It was made origi - nally made for Joseph Faria and was kept at Mission San Jose. The original owner who has since passed away, was an attorney named Joeseph Faria. Joseph was collector of fine instruments and in the late ‘80’s purchased many fine instruments from local makers which eventually were donated to Mission San Jose. It is a Ruckers-Taskin model, based on the 1646 Andreas Ruckers, rebuilt by Pascal Taskin in 1780 which is in the Musée Instrumental at the Cité de la Musique in Paris. John Phillips has built around 35 of them, and they have become his most popular model. UCD music department also has one, built in 1990. The DHS Harpsichord in - cludes a fourth register in soft leather (peau de buffle) which is present on the original, but only rarely on the copies. All the decorations on the inside of the instrument and including the lid cover (which is a mural that depicts the Resurrection of Christ) was done by John Phillips longtime assistant artist, Janine Johnson. The instrument cost brand new has been estimated at over $49,000, final purchase price was $10,000, plus the private alumni donor paid $6,000 making the total cost to the DHS Orchestra Program only $4,000!!! In speaking with the maker John Phillips confirmed that it is very rare for people who own this level of an instrument to resell them and even more impossible to get one at 90 % off its value. In the end it is an incredible story of many wonderfully knowledgeable and supportive people coming together and through their generosity helping to find the most perfect instrument for many generations of Baroque students to enjoy at DHS.